They may share your attention, an occasional snuggle together, and space on your sofa, but generally, there aren't many diseases a dog can catch from a cat. Though they can't share a cold or flu, dogs and cats are at risk for transmitting parasites to one another and may share certain cat to dog diseases. Fortunately, good preventive care will minimize most of the risk. If your dog shows symptoms that he's picked up something from your cat, he'll need his own treatment from the vet. The flea is efficient in just about every way, jumping on and off animals as he pleases and often leaving his mark. Often that means red skin, excessive itching and sometimes secondary infections and flea allergy dermatitis, according to Orkin. The tick is able to behave similarly, moving from host to host, putting your pet at risk for Lyme disease and Rocky Mountain spotted fever. Fortunately, there's a host of effective preventives on the market to keep fleas and ticks away from your cat and dog, according to 2ndChance.info. Sometimes they have a disagreement, or they may engage in rough play, and the cat may sink her teeth into the family dog. Your cat's pointy canine teeth are effective weapons, causing puncture wounds that become welcoming pockets for infection. Your dog may end up with an abscess from a tussle with the family cat. Signs of an abscess include a painful bump at the wound, fever and lethargy. Occasionally the abscess will break through the skin, emitting a nasty odor and pus. 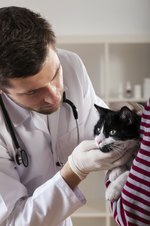 According to Vetstreet, an abscess requires veterinary treatment, including prescription antibiotics. One of the feline diseases that could spread to your dog is ringworm. It's one of the cat to dog diseases you may encounter. Despite the name "ringworm," this disease isn't a parasite but is a fungus, showing scaly, red rings on the skin. Ringworm typically presents on the face, ear tips, paws and tail. If your cat has ringworm, she can share it with you and your dog, warns 2ndChance.info. It doesn't take much to share ringworm -- just a scrape or a scratch releases the fungus spores. It's not unusual for a carrier pet to show no signs; some pets never become infected, despite exposure to the fungus. It takes months, but the condition eventually will clear itself, however you can hasten the process with thorough cleaning and disinfecting. There is a vaccine, however it's quite limited in use. Ultimately the best prevention is common sense, including not sharing grooming equipment, bedding, and cages. This will prevent any feline diseases like ringworm from becoming one of the unpleasant cat to dog diseases that you'll deal with. Parasite infection is fairly common in cats and dogs because they're so easily shared. It's one of the cat to dog diseases you may deal with. The most common parasites in pets are hookworm, roundworm, tapeworm and whipworm, according to petMD. The tapeworm is spread by an infected flea that your dog can ingest through routine grooming. The other common worms are spread through stool, where the worm's microscopic eggs find their way into the outside world from your pet's intestinal tract. Though it's unpleasant to think of your beloved pet eating poop, sometimes it happens -- likely on purpose with your dog -- or from grooming. Your pet unwittingly ingests eggs that perpetuate the cycle in his intestines. Diarrhea, vomiting, weight loss and a poor coat are signs of parasite infection. Cleaning up after your pets minimizes the chance of exposure. Regular veterinary checks and prescription wormers as needed will keep your pets parasite-free. One of the dog diseases that can be transmitted to humans is rabies. Rabies is a dangerous virus that can infect your cat, dog and you. An infected animal transmits the virus through a bite or scratch, or through contaminated saliva coming in contact with mucus membranes or a fresh, open wound, according to the ASPCA. Bats, raccoons, foxes and skunks are the most common carriers. If your cat hasn't been vaccinated and picked up the virus, she can transmit it to your dog. It takes two weeks to two months for symptoms to present; initial symptoms include apprehension, irritability and snappishness. The virus progresses making the animal extremely sensitive to sounds, light and touch; disorientation and staggering may occur, as well as seizures, eventually followed by death. Fortunately, rabies vaccinations are effective at preventing outbreaks among house pets, preventing dog diseases that might be transmitted to humans. Though your dog is prone to two types of mange -- sarcoptic and demodectic -- he's only vulnerable to catching sarcoptic mange from your cat. The parasitic mite Sarcoptes scabiei is the culprit for sarcoptic mange, resulting in a very itchy dog with red scaly skin and hair loss, according to the Merck Veterinary Manual. It usually starts in areas where your dog doesn't have much hair, such as his abdomen, ear flaps and elbows, but if not properly treated it can spread all over his body. There are a variety of treatment options, including spot-on treatments, oral and injectable medications and dips available from the vet to treat and prevent sarcoptic mange.